Should valve seats be in any way damaged, through valve recession or cracking etc, they can be repaired using valve seat inserts. 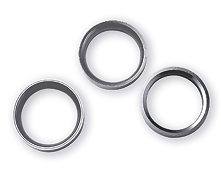 Valve seat inserts are rings of material which can be pressed into a pre-machined recess in the cylinder head to repair the worn or damaged areas. This repair operation is carried out on our Serdi 100 valve seat machining centre. An insert of a suitable diameter to repair the damage is selected from our stock range of inserts. These are available from stock in nominal 1mm increments although many special and “half sizes” are available to order. H T Howard only source inserts of the highest quality from respected suppliers. Available in a variety of materials including sintered and high nickel types, inserts of the correct specification can be purchased according to the application required and are available to suit “lead free” and gas/LPG applications. Once a damaged valve seat has been identified the basic repair procedure is the same for both cast iron and alloy cylinder heads. The cylinder head is set up on our Serdi 100 valve seat machining centre and the work head positioned and centred in the same way as for cutting valve seats. Once centred above the damaged area the recess to accept the new valve seat insert can be machined out. In the case of alloy cylinder heads this will mean having first removed the original insert. The new recess is first roughed out to within 1mm of the required diameter and then finished to size using a fixed diameter cutter which gives the correct interference fit for the insert blank to be installed. Each insert blank is then pre-machined on a lathe to remove any excess material particularly in the throat diameter to reduce the force it will exert on the head during the fitting process. The throat diameter will be left about 1mm undersize at this point. After machining, the head is heated in our bespoke N-Tec Solutions oven and the inserts placed in liquid nitrogen. The heating expands the head casting and the liquid nitrogen reduces the temperature of the inserts which contracts them. The combination of the two enables the fitting of the inserts to be done using as little pressure as possible. Once each is at the correct temperature the inserts are pressed home into their recesses. After the temperatures have stabilised and the head cooled back to room temperature the cylinder head can be returned to the Serdi 100 for the final machining process. At this stage each insert will just be a ring of material standing proud within the cylinder head. The excess material is removed from the top of the insert so that it is at the correct height within the casting and then the throat diameter is bored to ensure it is concentric with the port. The valve seat angles are then machined to give the correct widths of seat and any further throat and top cut angles added as required. Each valve seat is checked for height within the cylinder head and corrected to ensure valve spring pressure and tappet adjustment falls within specification. Once correct, each head is then hand finished giving the best possible match between the new insert and the original casting to ensure maximum gas flow and smooth running during use.